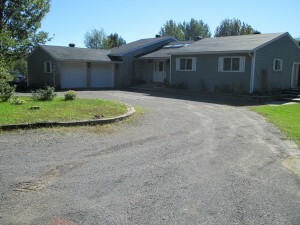 Beautiful 3+1 bedroom, 3 full bath bungalow on close to 25 acres! 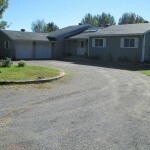 A double car garage with access to the home through the mudroom/laundry room. Incredible open plan layout with nothing but nature surrounding the home. Large foyer with skylights for extra brightness. The Kitchen and Dining Rooms are massive and come with heated floors. The Kitchen has a beautiful view of the acreage, a big island, new stainless steel appliances and loads of counter/cupboard space. The eat in nook has floor to ceiling windows, making one feel like you are in a solarium. The Dining Room has its own gas fireplace and sliding patio door access to the upper deck. It overlooks the sunken Living Room with its beautiful hardwood floor. The main floor bath has been completely renovated. All three bedrooms on this floor are generous in size. The Master Bedroom has sliding patio doors to its own private deck and a absolutely stunning spa-like ensuite bath. The lower level is completely finished. There is a forth berdroom, Family Room, Recreation Room, another full bathroom, an office room and loads of storage space. There is also sliding patio door access from the Family Room to the lower deck that surrounds the pool. Updates to the home/property include: ensuite/pool liner/equipment (2013), water pressure tank (2012), roof/septic tank/central air conditioner/furnace/watertreatment/softener w/reverse osmosis (2011). The property is just stunning. Almost 25 acres with an inground pool (completely fenced in), playstructure, walking trails, completely tastefully landscaped, fire pit area plus plus plus. Due to the large forested area, this property man be eligible for Managed Forest Incentive Program. This property is an absolute must see!